Pupils from the Mearns Academy cross-country team have been kitted out in style by a donation of T-shirts from Blaze Manufacturing Solutions and Grampian Growers. Pictured handing over the T-shirts to the pupils are Blaze finance director Ann Johnson and Grampian Growers production manager Fergus Kelly. The club meets once a week after school, starting with warm-up exercises and finishing with a three-kilometre run on the cross-country course. 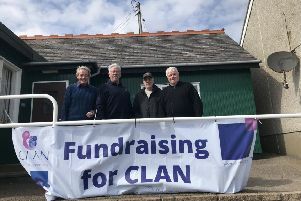 Staff also join in and run the course and as a club they enter various competitions including Run Balmoral, which takes place in later this month.